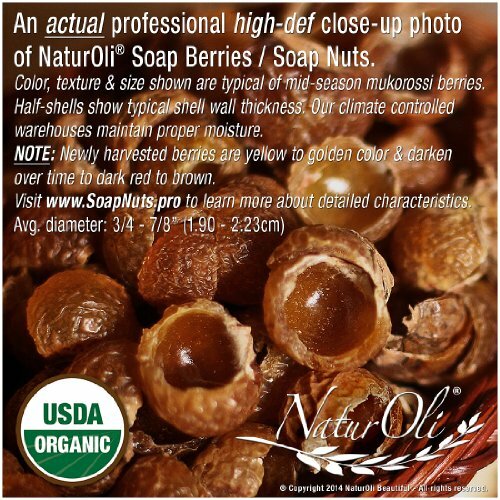 NaturOli Soap Nuts / Soap Berries - SALE! - 4 oz USDA ORGANIC + 18X BONUS! Select Seedless, Wash Bag, 8pg info, Tote Bag. Organic Laundry Soap / Natural Cleaner! Product prices and availability are accurate as of 2019-04-14 12:51:27 EDT and are subject to change. Any price and availability information displayed on http://www.amazon.com/ at the time of purchase will apply to the purchase of this product. USDA CERTIFIED ORGANIC - Best selling brand in the USA! 100% chemical free! Unscented. Extremely low cost per load! Acclaimed by the "Green Dot Awards, "Possibly the most significant green innovation in history for everyday household cleaning needs." "...a business with a Green Dot Award is a business that can be trusted by consumers with stewardship of the environment." 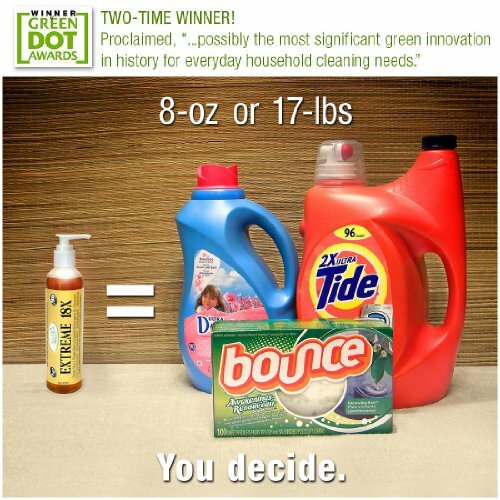 "BEST ECO-FRIENDLY DETERGENT" - the Examiner! "TOP 4 best grey-water system safe detergents & MOST AFFORDABLE" - LA Times! Mother Nature's gift - 100% natural laundry soap. A safe, economical, hypoallergenic, biodegradable alternative to harsh & harmful chemicals. 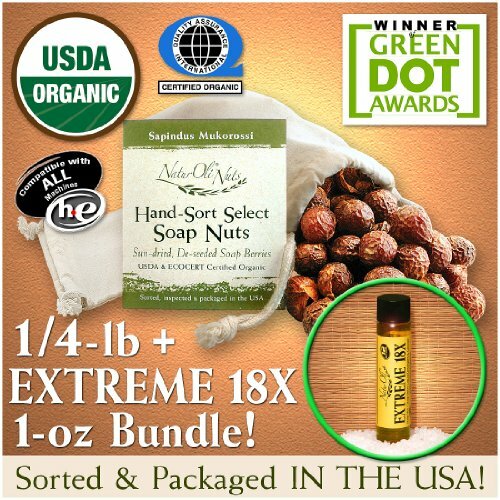 If you suffer from allergies, sensitive skin, or seek a greener earth soap Nuts are your answer! Soap Nuts are dried shells of the soapberry (a fruit) containing saponin - a highly effective cleaning agent. Saponin works like most detergents & soaps WITH NO CHEMICALS! Easily converted to powder or liquid. NaturOli Soap Nuts are selected for optimal quality & highest effectiveness - wild harvested Sapindus Mukorossi soap berries. Inspected, sorted, & packaged IN THE USA! Lab tested free of chemical & organic contaminants. Simple to use: 5-6 whole shells (1/2 oz) in wash bag, toss directly in washer with laundry (don't overstuff loads), reuse 7-10 times. Wash bag + 8-pg info & instructions included. Loads vary due to water type, temp, washer type, cycles used, etc. Est. loads are based on 1/2 oz per med. size loads. HE washers yield more loads. May use with traditional cleaning or whitening boosters. **Tip: Start fresh! Run a few warm or hot loads with rags to help purge washer of residual chemical buildup. Genuine USDA CERTIFIED ORGANIC soap nuts / soap berries. - #1 brand in America! - Award winning, premium 'Select' de-seeded. - Fresh, saponin-rich, wild-harvested, sun-dried Sapindus Mukorossi fruit from pristine Himalayans of India - the world's finest & most prized (see photos). - NaturOli is an authorized Processor for the USDA National Organic Program (USDA NOP) - the ONLY official U.S. Organic Certification agency. - Processed in the USA! ---- PACKAGED IN HEAVY-DUTY, REUSABLE MUSLIN / COTTON DRAWSTRING TOTE / STORAGE BAG. + 18X BONUS! ($5.90 value) - ALSO INCLUDES: ONE (1) large 3-1/4" x 4-1/2" extra-heavy-duty muslin wash bag, plus 8-pages of info & instructions! - A 1oz bottle of EXTREME 18X soap nut liquid super-concentrate washes up to 12 loads, or dilute with tap water for the best glass / surface cleaner you'll ever use! - Just 1oz produces 16+ oz of natural, non-toxic, eco-friendly, multi-purpose cleaners for the home, auto, boat or RV. Excellent for glass, hard surfaces, stainless, chrome, carpets & more. Safe for painted surfaces, leathers, TV / computer screens, etc. - Near limitless cleaning possibilities! NOT A CHINESE IMPORT!! - China-grown berries are NOT compliant with USDA's Agricultural Organic Safety Standards & Regulations - regardless of claims. - Only USDA Certification assures of NO agricultural pesticides, industrial pollutants, commercial fertilizers, hazardous toxins, & chemical contamination common to Chinese exports - especially farm & agricultural goods. ---- U.S. lab tested safe from biological contagions. Stored in our climate-controlled, USDA inspected warehouses for ideal moisture content - never too wet or dry. Not mushy or slimy. Light natural vinegary scent. NO petroleum or chemical odors. A GREAT LOW-COST INTRO PACKAGE!!! - With 18X Liquid Concentrate BONUS, too! (worth $5.90!) ---- DON'T BE FOOLED by claims about "LOADS". - Order by NET weight. You can rely on weight while loads vary greatly. - Low sudsing. Perfect for high efficiency (HE) & front loading washers. Reduces need for fabric softeners & dryer sheets. Saves money! Low cost per load! - Bought wisely, soap nuts are a super bargain, & they make doing laundry & home cleaning fun! -------- Find more products (including Combo Sets, Multi-Packs, plus Skin & Hair Care products) at our Amazon Brand Store: www.Amazon.com/NaturOli A true organic laundry soap, natural detergent & all-purpose, green household cleaner. Hypoallergenic & fragrance free. Ideal for sensitive skin & noses. Leaves laundry clean, soft & fresh. Superb for delicates, silks, wools, & organic fabrics. Excellent for cloth diapers. Odor removing. - Gentle, healthy & nourishing for both skin & hair, too. - A perfect biodegradable camper's soap (lightweight & convenient) with natural insect repellent properties. Great pet soap - naturally wards off fleas & ticks! --- Learn more at SoapNuts.Pro, the world's foremost online educational & instructional resource.